My original idea with this grass was to test its hardiness and suitability as a lawn grass. After I decided to not water a patch until it became unacceptable as a lawn to test the time between waterings, we had 3.5 mm of rain. This was three and a half weeks between waterings and was almost at the stage of considering it to be in need of a watering. As a general rule I would say that 3 weekly intervals would keep a reasonable greenness about the grass. It is looking a bit tatty at the moment as it hasn’t been trimmed since late spring. We have also had many days above 35C and at least ten days above 40C. 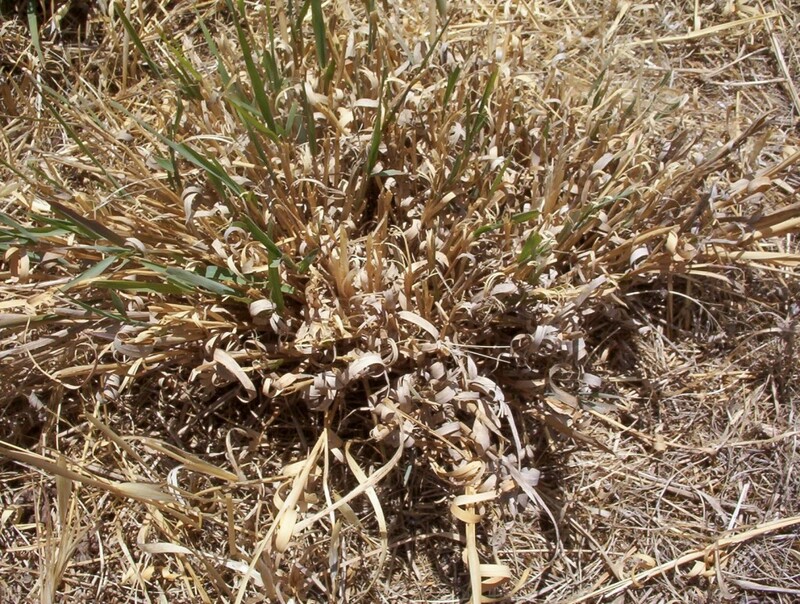 I certainly think it is worth persevering with this grass in low rainfall areas, especially in areas where it occurs naturally. See here for other posts on this topic. A plant that I admire but treat with great caution is Spinifex, Triodia scariosa (used to be called Triodia irritans). Just getting the photos was a hazard. Backing into one of these is a painful experience. It is the dome shape that I like and when in flower it is attractive. Even these with the seed heads were good to look at. They are amazing plants. Bush creatures find them a welcome refuge. Even Brer Rabbit would not have wanted Brer Fox to throw him into these. We saw a small spiny dragon lizard scuttle into one as we drove along the track at Lowan Conservation park. As the plants become older, the centre dies out and we have seen kangaroos resting in the middle of large clumps of spinifex. I just checked one of my reference books. 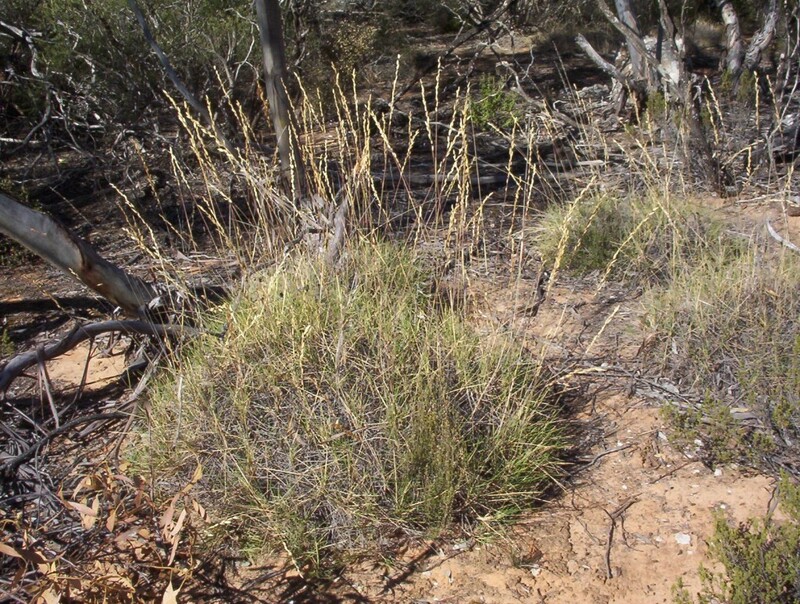 It appears that I should be calling this Porcupine Grass, as the coastal plant is Spinifex sericeus. Xanthorrhoea priessii is a Western Australian species. This species was one of the plants used by the winning garden at the Chelsea Flower Show. Xanthorrhoea quadrangulata and Xanthorrhoea semiplana are the South Australian species of Grass Tree. At an Arboretum near here, Xanthorrhoea preissii and Xanthorrhoea semiplana have both been planted on deep sand. After four years of growth in the ground, the cluster of leaves is about 60cm tall and beginning to ‘vase’ out in a very graceful way. The width of the clump is larger than the reach of two hands joined finger tip to finger tip as if holding a large bunch of flowers. It is certainly worth while growing these for the leaf display if this is what the growth is like after 4 years. 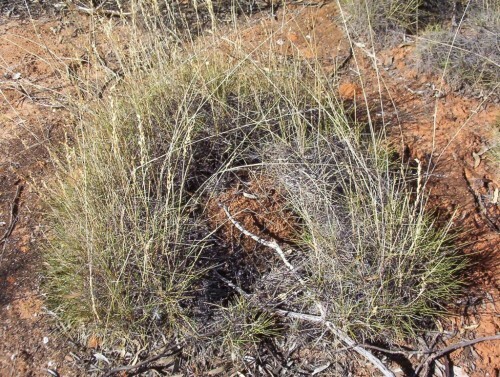 Xanthorrhoea semiplana generally does not make a trunk although sometimes one up to a metre will appear, whereas the other does to about 3 metres tall. However to see a ‘decent’ trunk on Xanthorrhoea semiplana in one’s lifetime is probably only to be dreamed about! Xanthorrhoea need a sunny well drained position. They look wonderful growing in a rockery and will also look great in a large pot as an impressive feature plant. Specimens have flowered after 7 years in Brisbane and 10 years at the Australian National Botanic Gardens. It has been discovered that the Yellow Tailed Black Cockatoos love the seed pods that form along the flower stem which can be as much as 4-5 metres tall. They have been observed eating them soon after sunrise between Tintinara and Keith on the side of the road. Lomandra hystrix flowers in summer. The species grows naturally in Queensland and New South Wales. The plant can be used as a soil binder for banks. It will cope with being flooded occasionally and poor drainage. It will also grow in heavy shade or in full sun. 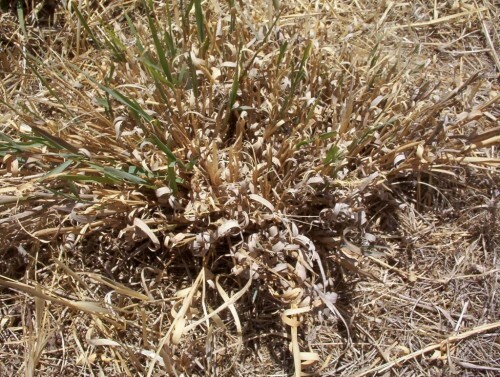 The plants can be left to fend for themselves in many locations and are frost hardy. These plants also can be planted in pots for outside cultivation or be used as indoor plants. The foiliage will arch over and be useful for concealing areas in the garden, or softening the edges of concrete. Other species with this tufted growth habit look good growing at the base of trees. This Lomandra would look good in that situation also. You are currently browsing the archives for the Tufted Plants category.